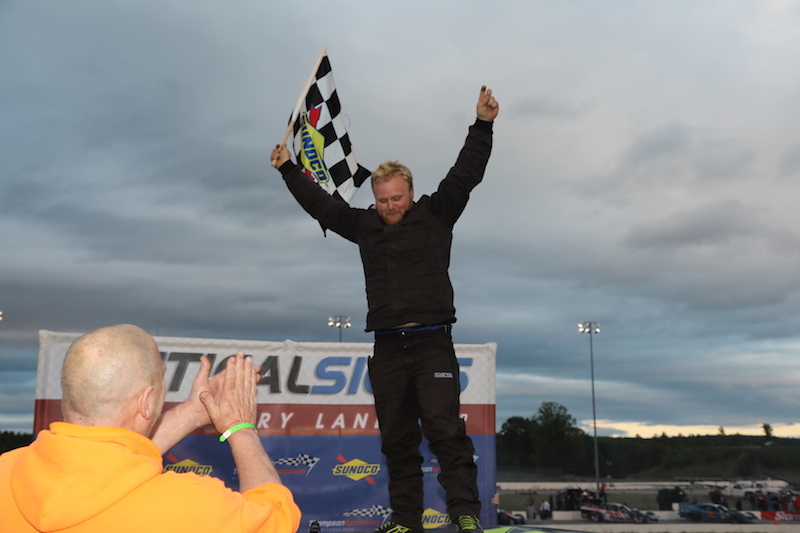 THOMPSON – Goal met, onto the next challenge for Ryan Waterman at Thompson Speedway. Waterman held off the late charge of Shawn Monahan to win the 20-lap Limited Sportsman feature at Thompson Speedway. It was the second consecutive victory for Waterman, of Danielson. Monahan, of Waterford, was second and Scott Sundeen of Douglas, Mass. third. Monahan got under Waterman in the final corner and gave him a slight nudge, but it wasn’t enough to change the order at the front. After missing last week’s event at Thompson, Wayne Burroughs Jr. of Oakdale returned to the track victorious by holding off Eric Bourgeois to win the 15-lap Mini Stock feature. Burroughs had scheduled a vacation for June 7, so was forced to miss an event when the originally scheduled May 20 show was made up on that day. Bourgeois, of East Haddam, had won the first two Mini Stock events of the season. He finished second. Dave Trudeau of Mansfield was third. Mark Jenison of Warwick, R.I. won the 25-lap Late Model feature. Woody Pitkat of Stafford was second and Tom Carey III of New Salem was third. Danny Cugini of Marshfield, Mass. won the 25-lap NEMA Lites feature.